Listen as sixteen local unpaid carers talk about their lives and caring roles as part of our Walk a Mile in My Shoes project. Their stories have been made into short audio clips where they explain the good, the bad, the difficult, the frustrating, the funny and rewarding aspects of caring. 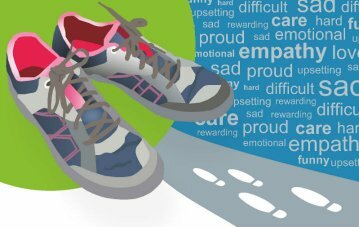 Derbyshire County Council's asked local carers to share their experiences and participate in a empathy project called Walk a Mile in a My Shoes. Thirteen local carers shared their stories for the project and these have been arranged into an online library of audio clips which you can listen to in our carer stories section. What's is Walk a Mile in My Shoes? The project idea was developed from work carried out by the Empathy Museum, who set up the first “A Mile in My Shoes” project to promote empathy by getting people thinking about what other people's lives are like. The museum set up a mobile ‘shoe shop’ where visitors are invited to Walk a Mile in someone else's shoes - literally. When members of the public visited the Walk a Mile 'shoe shop' they're asked to choose a pair of unfamiliar shoes to walk a mile in while listening to an audio recording of someone else’s life story (or a day in their life) through headphones. Last year, the Health Foundation teamed up with the Museum to develop a collection of stories from people using and working in health and social care services in the UK. This included parent carer Becky Wyatt who recorded her story. Derbyshire County Council Adult Care decided to carry on the 'walk a mile' theme but concentrate on carer stories by running a Derbyshire based “Walk a Mile in My Shoes” project . The idea is to give local people the opportunity to step into the shoes of carers and see the world through their eyes. Volunteer carers were recruited from across the county via the many groups and organisations for carers in Derbyshire, and through local and social media. The Council also approached groups supporting communities of interest and other minority groups to make sure the voices of Derbyshire’s diverse populations are included. Volunteers were asked to do two things; firstly, they were asked to choose a favourite pair of their shoes that they felt represents their lives to be photographed and secondly, to make a short audio recording describing the good, the bad, the funny and the sad aspects of their life as a carer and any key messages they wish to share. One of the key messages that came from the stories is that getting support from other carers is invaluable. Many of the carers who shared their story said that meeting and becoming friends with others in a similar situtation has been a big support to them. Others said that they felt some health and social care services still didn't seem to undertstand their role and could be more supportive, particularly if the cared for person was a young person rather than someone elderly. The key themes and messages from the stories will be collected together over the coming weeks and given to health and social care organisations. Thank you to all the carers who have taken part and shared their stories - your stories are inspring. And thanks to all those who've assisted along the way with helping to find volunteer carers and promoting the project. During Carers Week, the Council's team went out to events and venues around the County promoting the project and speaking to members of the public. The response was very positive and many people were shocked to hear how much carers are estimated to save the economy - £880m each year. If you would like Council staff to give a presentation or talk about Walk a Mile to your organisation or group please contact the Adult Care Information Team on tel: 01629 531310 or use the contact us form.